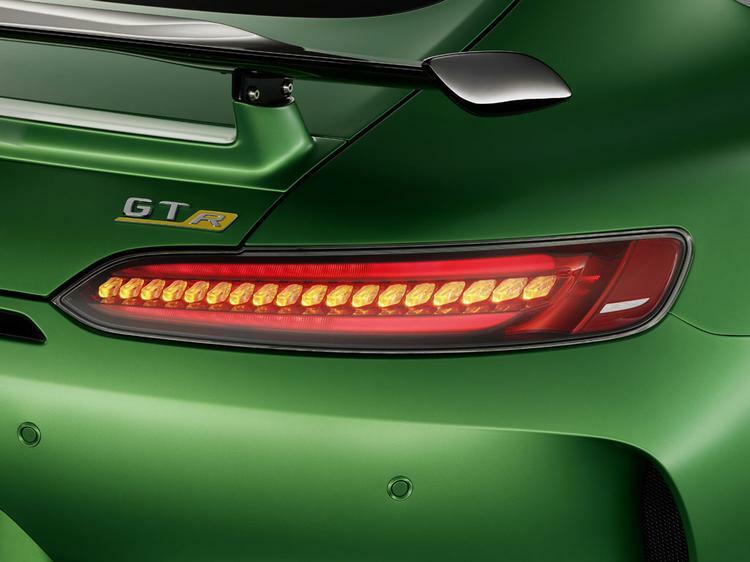 Wider tracks, active aero, nine-way adjustable traction control and 585hp - the GT gets serious! 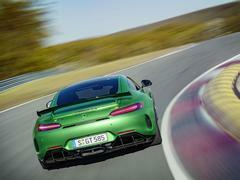 It seems like the faster AMG GT has been in discussion for yonks, the first spy shots and video emerging in April last year and rumoured seemingly since the first GT drive. But here we finally have it in all its - guess the inspiration - 'AMG Green Hell Magno' glory: the AMG GT R.
There's an "active aerodynamics profile" in the underbody ahead of the engine; with Race mode engaged and the speed at 50mph, the piece of carbon moves down by 40mm and "changes the airflow considerably." A genuine Venturi effect apparently, said to reduce lift by 40kg on the front axle at 155mph and increase both steering precision and stability. It's spring mounted to protect against damage and works with the radiator air outlet to divert air to the rear diffuser. 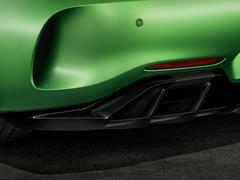 But before we get too far underneath, it's worth discussing the rest of the GT R exterior. The tracks are 46mm wider at the front and 57mm at the back, accommodated by new carbon arches. The 10-spoke wheels are forged and use - you've guessed it - Michelin Cup 2 tyres, with a 275-section at the front and 325 at the back. 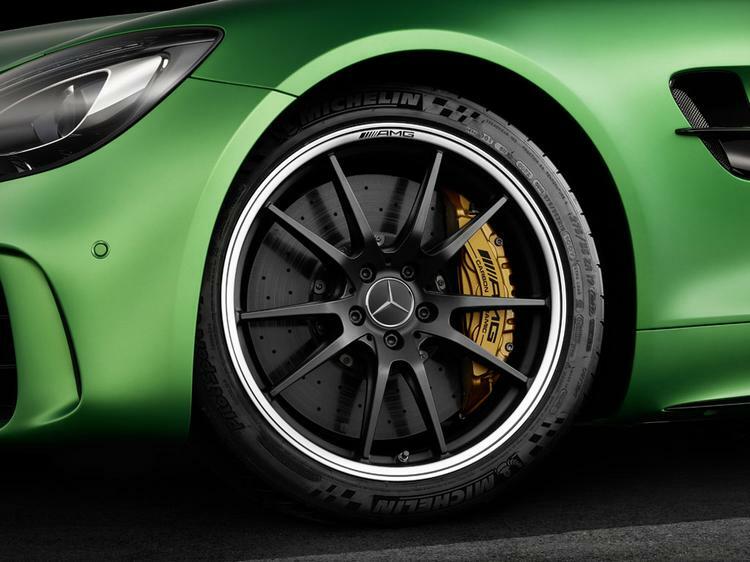 Carbon ceramic brakes are optional (and save 17kg), the standard composite rotors measuring 390mm on the front axle and 360mm on the rear. 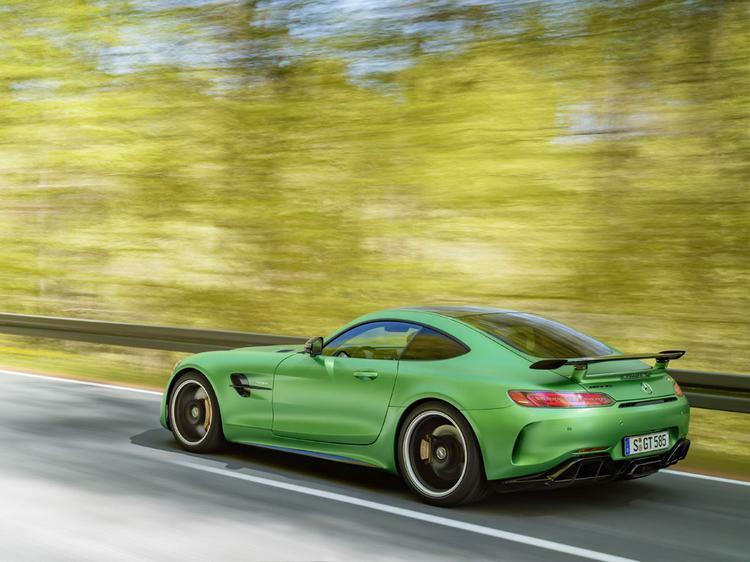 The exhaust uses a titanium silencer to save 6kg of weight and the rear spoiler is manually adjustable. All sounds rather good, doesn't it? 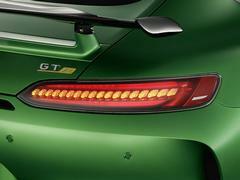 The GT R's kerbweight is even 15kg lighter than a GT S, at 1,555kg DIN (so that's without a driver, but with fluids). And it gets better too. So much better. Power is up to 585hp thanks to new turbos with increased boost pressure (now 1.35 bar, from 1.2), a smaller 'wastegate aneroid capsule' a remap. A lighter flywheel as well as an "extensively revised" dual-clutch transmission promise an even more responsive and revvy character too. With an updated Race Start function (more revs, better wheel control), AMG claims a 0-62mph time of 3.6 seconds and a top speed of 197mph. 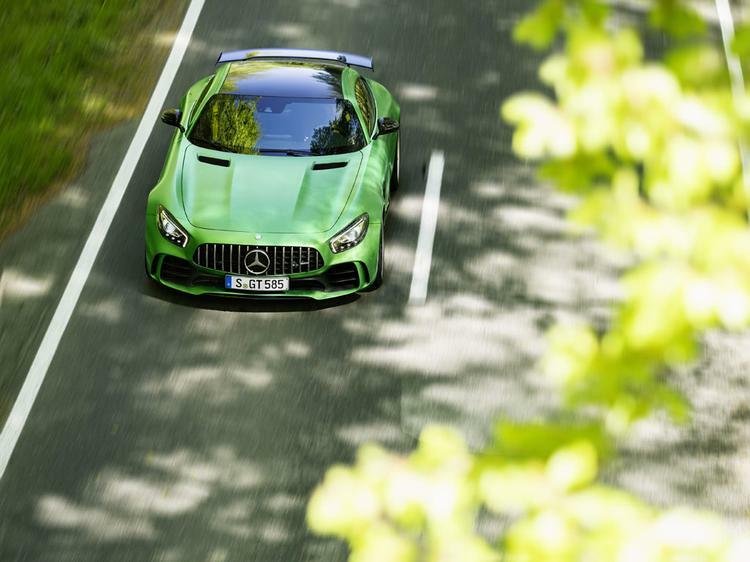 Considerable effort has been invested into the GT R's aero, with electronically controlled louvres in the front controlling air flow, a double diffuser, new rear vents and that huge rear wing all added. Together, they're said to give the R another 155kg of downforce at top speed compared to an S, amazingly with a lower drag co-efficient as well. The changes elsewhere are equally substantial. The suspension now uses forged aluminium wishbones steering knuckles and hub carriers on both axles (yes, both axles, we'll get to the four-wheel steer soon), the rear anti-roll bar is thicker (but lighter because it's hollow) and the adjustable coilovers are unique to this car. 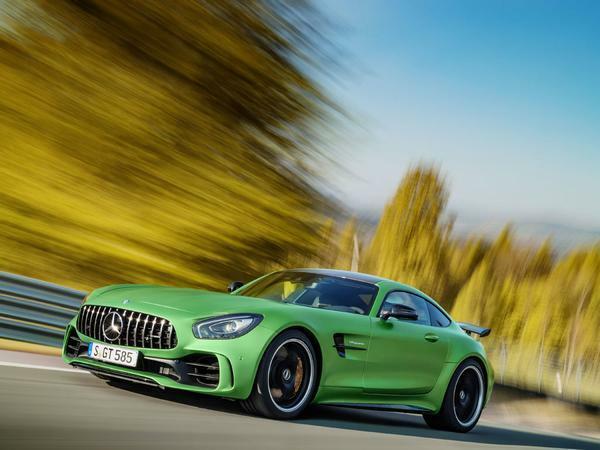 The springs work in conjunction with the AMG Ride Control adaptive dampers, with the three familiar modes (Comfort, Sport and Sport Plus) adjusting the compression and rebound characteristics. 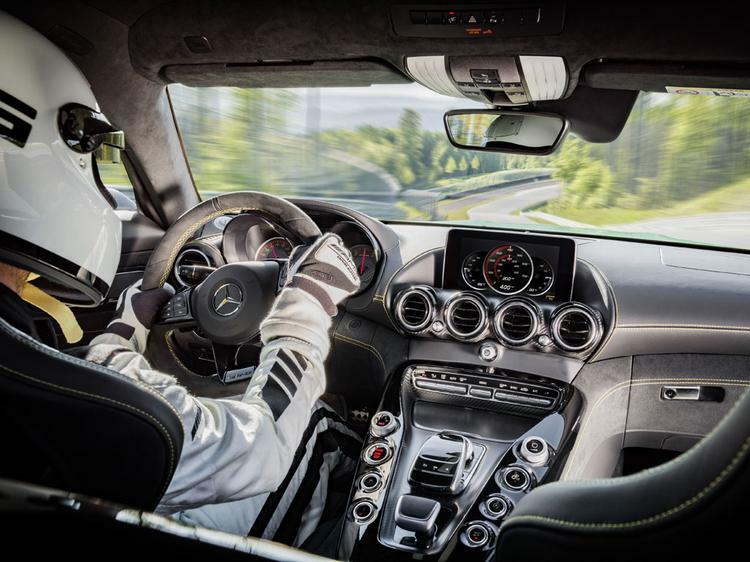 You'll want Sport for the Nordschleife, apparently. The four-wheel steer is not mechanically linked to the steering wheel, operating via two electro-mechanical actuators on the rear axle and with a maximum toe angle change of 1.5 degrees. It steers in the opposite direction to the front at up to 62mph for agility (which seems pretty high), then with the front wheels for stability beyond that. 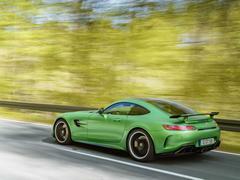 AMG says it makes the car "far more agile" with "even greater driving enjoyment and less steering effort". On the electronics side, the ESP retains its On, Sport Handling and Off modes. 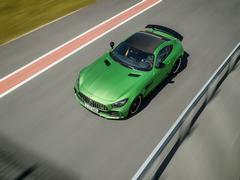 Apparently the programming for the Off setting is taken from the AMG GT3 car. The traction control sounds very cool as well, which is perhaps the first time that's ever been said. It works through nine different settings (see that illuminated rotary dial beneath the air vents) and doesn't affect the ESP's intervention. So you could have the most lenient traction setting with the most stringent ESP safety net, a strategy again taken from motorsport. Level 1 is the strictest, Level 9 providing "maximum slip on the rear axle". AMG says its advantage is in a virtual mu simulator which helps to anticipate situations and therefore respond more quickly. The electronic limited-slip diff is carried over from the standard GT. Want more? Good! Torsional rigidity is up 7.5 per cent thanks to a carbon 'tunnel cross' beneath the exhaust and torque tube, plus two diagonal braces under the bonnet. 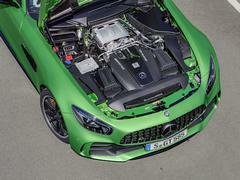 A stiffer body means a better controlled car on the racetrack, in case you hadn't got that message already. Finally, there are a few worthwhile points inside. See the manually adjustable bucket seats (a weight saving of 16kg) and the standard Night Package, which makes the steering wheel bezel and shift paddles black. There's more black thanks to the Piano Lacquer pack too. The overhaul isn't as transformative as underneath but it still looks pretty damn good from here. 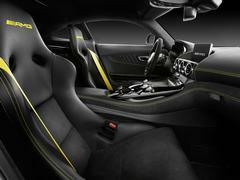 And wouldn't you rather have money spent on carbon panels and four-wheel steering than some fancy interior bits? 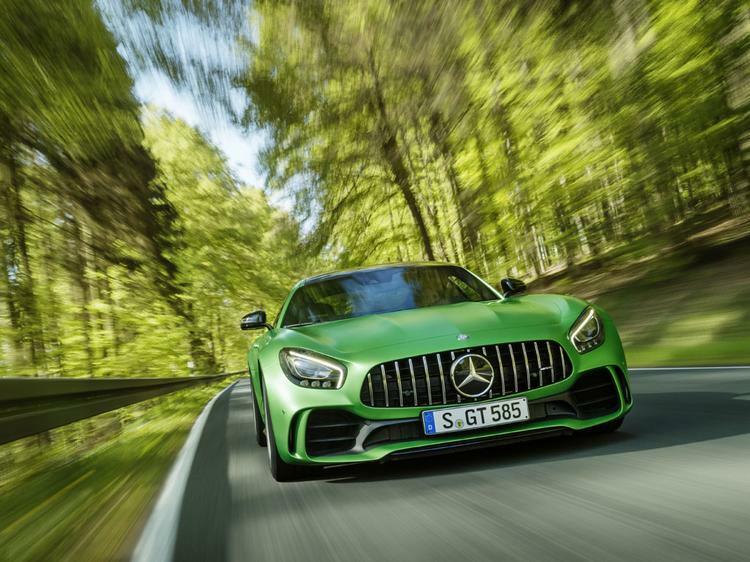 It's shaping up to be a pretty staggering vehicle, this AMG GT R, and further proof of how serious AMG takes its sporting aspirations. It's been revealed at Brooklands today, with sales commencing in November. The launch is scheduled for next March - bring on the group track tests! Looks ghastly, a scared frog. Looks lovely, apart from the typical awful looking tablet mounted above the vents on the dash. Although it's not as bad as others I've seen it still looks awful. 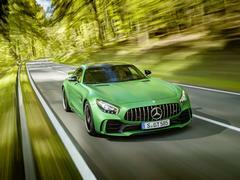 The only current Mercedes-Benz that isn't horrendously ugly and they made it ugly.